Have We Turned the Corner On Kentucky’s Hepatitis-A Epidemic? The drama surrounding Kentucky’s epidemic of Hepatitis-A continues. Chris Kenning reported today for the Courier-Journal that Dr. John Bennett, current infectious disease branch manager, was dismissed last Friday. No specific reason was offered, but this is the second dismissal from that position in less than a year. His predecessor, Dr. Robert Brawley, was similarly dismissed less than a year ago after he lobbied for a more aggressive approach for what became the worst the Hep-A epidemic in the country. No doubt Governor Bevin’s administration will continue to deny that there was any connection between Dr. Brawley’s recommendation and his dismissal. Dr. Bennett inherited a mess. A reasonable person might speculate that he is taking the fall for criticism that has been directed toward higher-ups in the administration. We may never know. However, turmoil as we deal with a new outbreak of serious, food-born E. Coli infection is not what we need now. Hep-A and E. coli pathogens are both transmitted by feces of infected individuals– basic sanitation stuff. There are other threats of serious infections on the horizon that we may need to deal with including a drug-resistant fungus, Candida auris. 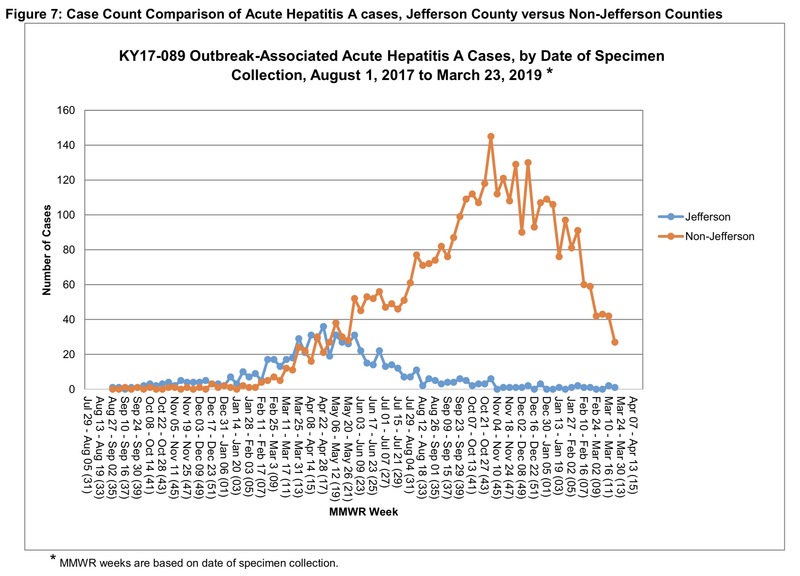 Above is an updated graph from Frankfort showing new cases of Hep-A up to the week through March 23. It appears to show a sharp drop for the most recent week, but I assert that it is premature to conclude that the epidemic is ending. The report from which the figure is extracted warns that all cases in the current period have not yet been incorporated into the totals. Indeed, charts from earlier weeks that initially showed apparent trends downward before all the cases were counted ended up hovering around 40 new Non-Jefferson County cases per week. Over the last 4 reporting weeks, the number of counties having new cases decreased only from 21 to 19. The number of counties having at least one case during the epidemic continues to increase, now up to 105 counties. We are not yet home-free. I do not have access to updated data for Kentucky’s ongoing Hepatitis-B, Hepatitis-C, and HIV epidemics which remain endemic threats. We deserve some stability and are owed more confidence than we now enjoy. Previous Previous post: Our Vanishing Right to Patient Privacy.